Massanutten Village is the oldest and largest area in the Massanutten community. The development of the planned residential community began in 1971 within an exclusive Rockingham County Zoning District called a Residential Planned Community (R-4) District. In January 1974, the Massanutten Property Owners Association (MPOA) was formed and incorporated under Virginia law. The Articles of Incorporation state that MPOA was formed «to provide for security and for maintenance of streets, open areas, trails, recreational and other facilities» owned by MPOA — it does not operate for the gain or profit of its members. MPOA has members made up of owners of properties in Massanutten Village. There are two (2) classes of members. «Periodic» members are owners of timeshare units and have no voting privileges. «Year-Round» members are owners of properties and have voting privileges equal to one vote per lot. The «Year-Round» members elect eleven (11) of the thirteen (13) Directors that make up the MPOA Board which carries out the purposes and exercises the powers of the corporation. It should be noted that one unelected Director represents Great Eastern Resorts and one unelected Director represents the Mountainside Villas Owners Association. It should also be noted that «Year-Round» members consist of both property owners who are full time residents in Massanutten Village (roughly 60%) and who are property owners who permanently reside outside the community (roughly 40%). Additionally, the MPOA Bylaws allow for the hiring of an Administrator to serve as the chief operations officer of MPOA. He is in charge of the general management of all functions relative to security and maintenance; the supervision and use of facilities; and the enforcement of the Rules & Regulations regarding the use and development of the properties. The Administrator is responsible for a total budget that was just slightly less than $2.5 million in 2009. Currently, he oversees seventy (70) people — thirty-one (31) are full time. 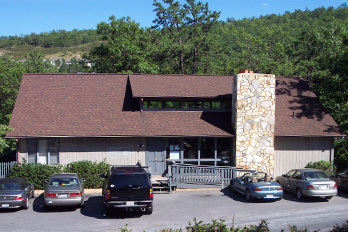 He and his immediate staff of four (4) full time employees are located in a 4,500 square foot Administration Building (shown in the photo on the right) that includes a large conference room for Board meetings, for use by MPOA members, and for rental by private citizens. In 2009, MPOA Administration had an operating budget of $506,648. The MPOA Administrator basically manages four separate departments. Previous sections of this report detailed the MPOA Police and Maintenance Departments that employ a total of twenty (20) full time employees. These Departments provide law enforcement and maintenance services for the Association. A previous section of this report also detailed the Parks and Recreation Department that employs two (2) full time employees and thirty-nine (39) part time employees. This Department maintains and operates MPOA parks and recreation to include amenities for property owners to enjoy and commercial ventures to generate net revenues to help offset the costs of the law enforcement and maintenance services. And, MPOA has a department that manages the rentals of timeshare units owned by its MPOA members also generating net revenues to help offset the costs of the law enforcement and maintenance services. This department has four (4) full time employees who work out of the MPOA Administration Building. A breakdown of employees is shown in the table below. 3rd largest law enforcement budget with the largest police department. largest assessed value of real estate property. Massanutten Village may be a private-gated residential community governed by a property owners association that provides some essential services. However, it looks and acts very much like any other town in Rockingham County with one very important exception. It cannot, pursuant to VA Law, create and/or amend Ordinances and a Comprehensive Plan. These services are provided by Rockingham County.